Ricoh may not be the first name that comes to mind when considering a short-throw projector, but their new PJ WX4130N may change that. With a native resolution of 1280x800, the DLP-based WX4130 puts out 2,500 lumens with one of the best brightness uniformity numbers we have ever seen for a short-throw projector . . . 89%. That is hard to achieve when the projected light comes from the shallow angle required to get the projector close to the screen. Another distinct design element is the WX4130N's enclosed mirror. Most short-throw projectors have an exposed aspheric mirror at the back of the projector that reflects light onto the screen from a rear-facing projection lens. The downside of this approach is that the mirror is exposed to scratching, dust, spilled liquids, and other contamination. Ricoh has designed an enclosed concave free-form mirror into the WX4130 that delivers uniform brightness at a very short distance from the screen. For example, an 80" diagonal can be achieved with the projector only 9 3/4" from the screen. This is the best throw ratio we have seen in a short-throw projector. Of course, getting close to the screen doesn't mean much if the image is less than engaging, but the WX4130N does not disappoint with top-notch data and video quality. To top things off, the "N' portion of the Model number stands for "Networked", and the WX1430N offers many ways to connect to a wired or a wireless network. There is even an iPad app available that connects multiple iPads and links them wirelessly to the WX4130N to display the iPad image. 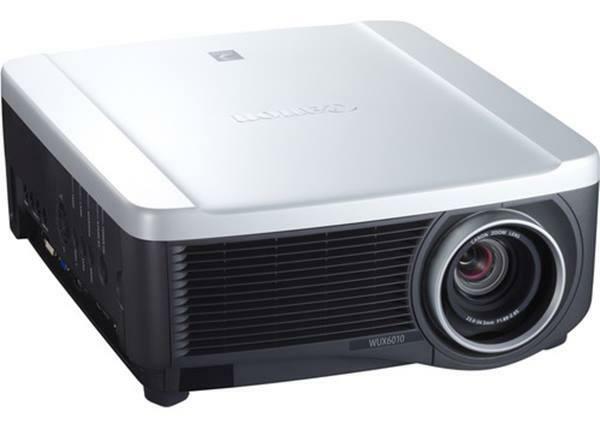 At a list price of $1,900, the WX4130N is not the lowest priced short-throw projector on the market, but its performance will justify that price in many situations. If networking is not a priority, Ricoh offers the same features in the non-networked Model PJ WX4130 for $1,650. The first thing you notice as the WX4130N comes out of the box is its vertical orientation. Its footprint is only 4.75" x 9.75", but it is stable on its feet in part due to its weight of 6.6 pounds. Cables plug in at the lower right side so they can be routed easily between the projector and the wall. The bottom of the image varies from roughly 4-6" above the top of the projector depending on image size, so tabletop or cart mounting works for most rooms. One thing to be aware of is that short-throw projectors can have significant image distortion when projecting on non-flat surfaces. For example, if you are using a portable roll-up screen that has vertical waves due to low tension, the image will not look square across the top edge. You can reduce this effect by tilting the screen forward, but you will also have to apply some keystone correction which reduces image brightness. Data images were crisp with very good color saturation, and even small fonts were readable at full keystone correction. Edge-to-edge focus was excellent and easily adjustable with a knurled recessed knob at the rear of the projector. Video images were surprisingly well defined given the WX4130N's relatively modest 2,500:1 contrast ratio. Flesh tones were on the mark without any adjustment to picture controls although a slight increase in contrast gave the image a bit more depth. Shadow definition was good although highlights were slightly muddled. All in all, both data and video images were better than most short-throw projectors we have seen.